You see, for about a year now I’ve been kicking around the idea of starting a business here but there’s been a lot of fear holding me back. I still find it a little fearful, but John Wayne said that courage is being afraid but saddling up anyway. I am not yet ready to talk too much about my business idea, but the business consultant I had lunch with, David, gave me several websites to look at for help with starting a business, and while I was looking at the sites, I found one that had a free online class scheduled for Wednesday. It took quite a lot of doing to get registered for the class in time, but I finally managed to get linked with it and listened to what their program has to offer. All of this has jump-started me into action to take some beginning steps and as I have progressed, it seems like things have just fallen into place. I’m still probably a year or two from seeing this idea come into fruition, but I am fairly certain that God has placed this on my heart to do, and I am praying that if this isn’t His will, He’ll close a door somewhere along the way. So far, every door I’ve pushed on has opened wide! Also on Monday, Mark and I worked some more on burning piles of branches in the back yard. 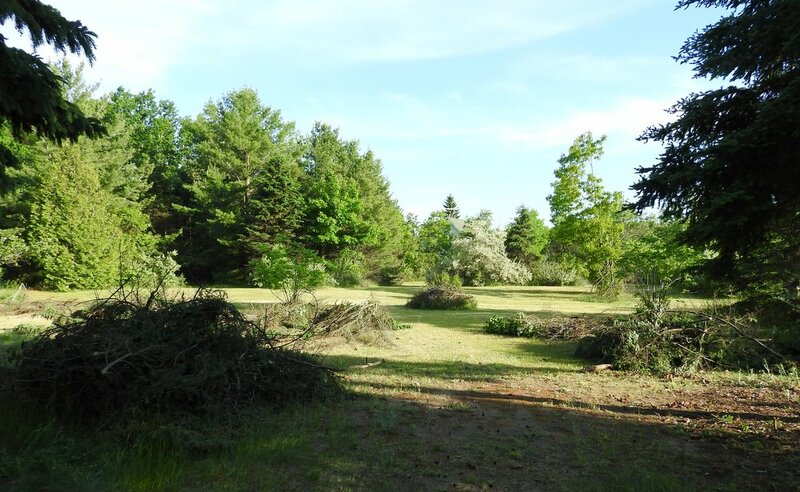 This is what our back yard looked like last summer after doing a lot of pruning. It still looked like this when we returned this year. This is what it is beginning to look like. So far, we’ve done three days of burning and there are no piles left in the “back forty”. (The pile you see here is the burn pile we lit on Monday. It’s no longer there.) We still have piles I made in the front yard earlier this season. Yesterday, I attended my first quilt guild meeting. I’ve known the Trillium Quilt Guild has been in Sister Bay for several years, but I guess I never mustered the courage to check it out on my own and my quilting friends’ schedules have never permitted them to go with me. I finally got the nerve to go by myself, and it turned out that yesterday was the 20th anniversary of the guild. I got to hear the history and learn what they do and I think I might join. Then I went to work at the Visitor Center, and after work, one of my co-workers, Lynn, and I went to see a musical by a theater company that offered to give free tickets to Visitor Center employees as a promotional thing. Their hope is that we will tell tourists who stop into the center about it. I kind of enjoyed it, but Lynn was only interested in the costumes and the sets. I was glad to get out and do something different. While we were together, Lynn asked if I would be interested in also working at her other job. She works as a docent at the Noble House in Fish Creek. That’s three towns south of Ellison Bay, but the pay she mentioned is good. Today, I went and watched Lynn give a tour, and then I met with her boss. They were initially going to have someone from Williamsburg, PA who was well trained to be a docent work on Wednesdays and Fridays, but she couldn’t find housing in the area so she couldn’t come. So far, all season, the staff has been overstretched trying to fill those two days. Yesterday, Lynn was telling her boss that she and I were going out to a play and that I didn’t have enough hours at the Visitor Center. Her boss asked her why she hadn’t told her about me before. When I met with her boss, she practically hired me on the spot. All that remained was to give me a costume. This summer, they are doing a theme of Victorian funerals, so I needed a black dress. They gave one to me to try on that none of the other docents have been able to fit into, and it fit me. It’s like it was meant for me! 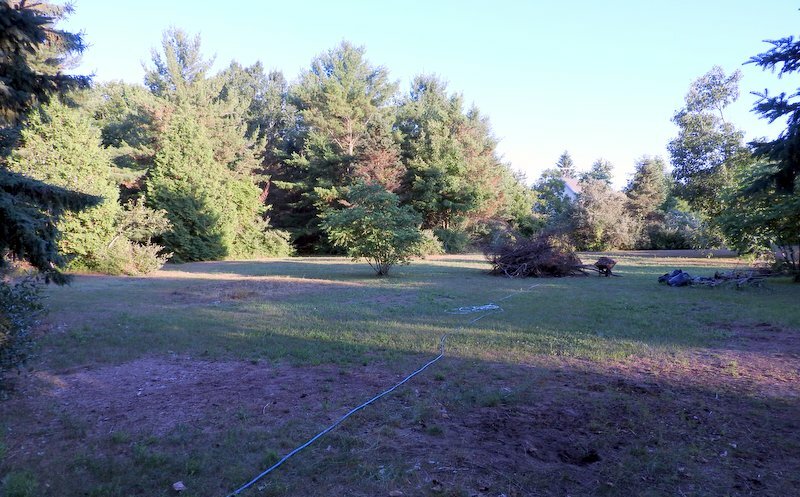 This entry was posted in Business, Christian Witness, Entertainment, Friends, Home, Pictures, Work and tagged Door County, Friends, home, job search, photos, starting a business, work by Denise Fuller. Bookmark the permalink. Excellent! God’s timing is always perfect.